The central Asian nation of Turkmenistan has cemented its reputation for eccentricity with an ambitious attempt to create a vast lake in the centre of the country's Karakum desert. In a logic-defying feat that might have appealed to Stalin, engineers have begun pumping water from a network of canals that irrigate cotton fields across the country. It is being channelled into the natural Karashor depression in remote northern Turkmenistan. The aim: to make what has been poetically dubbed Golden Age Lake. 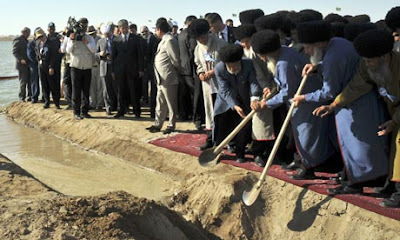 At an opening ceremony on Wednesday, the country's president, Gurbanguli Berdymukhamedov, plunged a spade into the earth and released the first water from a tributary canal. Surrounded by shimmering desert, dignitaries and local tribesmen, he declared: "We have brought new life to these once-lifeless sands." 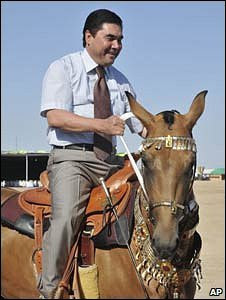 In comments reported by the state-run Neutral Turkmenistan newspaper, he said: "I am convinced that our great deeds will be recalled by glory." The president then rode off on a jewellery-bedecked horse, climbed into his helicopter and flew back to the capital, Ashgabat. Experts have expressed dismay at the quixotic Soviet-style project. They point out that much of the water pumped into the searing desert will evaporate, adding that it is likely to be contaminated with toxic pesticides and fertilisers. Turkmen officials disagree. They insist the lake will attract migratory birds, stimulate biodiversity and make flowers and plants bloom in a country that is 80% desert. Once completed the lake is supposed to cover 770 square miles, reach a depth of around 70 metres and hold more than 130bn cubic metres of water. Filling it could take 15 years and cost up to $4.5bn. This is not the first project in Turkmenistan to raise eyebrows. The government recently unveiled a new tourist resort on the shores of the Caspian Sea designed to rival Las Vegas. Currently, western tourists have great difficulties obtaining visas for Turkmenistan, and most foreign journalists are banned. The former Soviet republic's late dictator Saparmurat Niyazov dreamed up the Golden Lake project before his sudden death in 2006. His successor, Berdymukhamedov, buoyed by soaring incomes from gas exports, decided to press ahead with the idea despite fierce objections from environmentalists. "These canals will serve as a major source of irrigation to turn the Karakum into a blossoming oasis," Berdymukhamedov told a crowd of more than 1,000 people that included top government officials and diplomats. History suggests that he is making a mistake. For decades, central Asia's environment has suffered from over-ambitious Soviet-era irrigation projects. The Aral Sea, which once lay on the border between the former Soviet republics of Kazakhstan and Uzbekistan, was the world's fourth-largest lake. It has since shrunk by almost 90%, devastating fisheries as salinity levels spiked.